I was looking forward to this soup but it was not particularly tasty. It wasn't terrible, just not as good as the other Exante products for my tastebuds. I couldn't discern any chicken flavour and was more like vegetable stock, but not as nice as Marigold stock, more of a supermarket own brand vegetable stock cube. 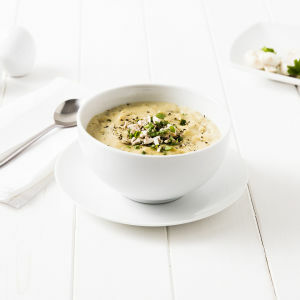 Love this soup, it is so thick and tastes so delicious. Hmm... I didn’t dislike or like this one particularly. It was fairly flavoursome, mixed well and was filling but I couldn’t distinguish any chicken taste...just a vague savoury flavour. That being said, it was pleasant enough for a low calorie soup mix. Felt this tasted more just like leek soup than chicken and I couldn't taste the chicken at all. That being said it wasn't disgusting just very powerful with leek. Very good, you don’t publish my critical reviews, let us see what you do with this. What have Exante been doing to some of the range. This soup is different it is horrible. The same for the Pasta & Ham which used to be 5 star but now tastes Yuk! Ni e tasting soup but lacks seasoning so I just added salt and pepper and it was fine.